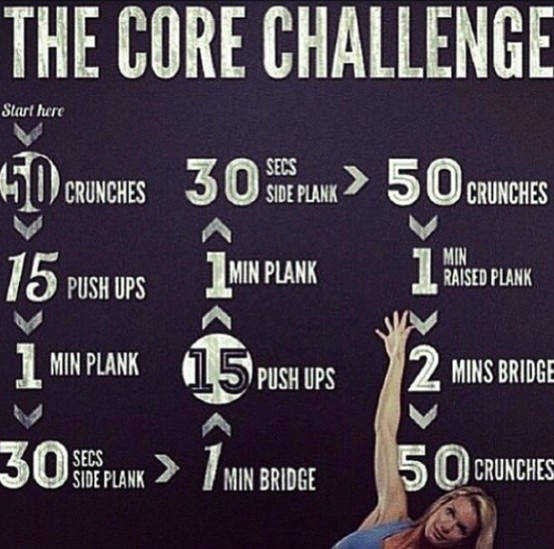 When I first started my core workout classes, I could barely do anything. But I made a commitment to lose the baby weight and I knew I needed help. So I decided to show up to 3-4 classes each week and work diligently to complete each repetition to the best of my ability. It’s working. All of my clothes have been altered (smaller), I have tons more energy and I have fancy muscles. The workout above will get you started. Do this every day for 15 minutes–and stay committed. It isn’t easy, but it’s worth it. Tip! Try scheduling regular time in your day so you don’t miss this important appointment. Or during commercial breaks, complete these exercises. Whatever it takes to do 15 minutes of core exercises, make it happen. When I was in college, I did about 400 crunches per day. The wrong way. And you guessed it, I didn’t see the results I wanted (but I was naturally skinny in college, so who cared). Now I understand the basic principles of workouts and correct form makes a huge difference. When you take your time with each exercise and use correct form, you’ll feel a difference and you’ll see a difference much quicker (remember it takes time to develop muscle–don’t give up after a few days). Tip! Look at the ceiling when doing crunches–pick one spot, you’ll focus more on your progress and protect your neck. Bonus! Lowering your head for planks or push-ups doesn’t get you closer to your goal; it just hurts your neck. Keep your head even with you shoulders. You’ll get comfortable with your exercises and after about a month, you’ll see results. This is when you need to mix it up. If you do the same thing every day, your body gets too used to the exercises and gets lazy. For workout routines, you want to keep your body guessing so you keep the results coming. Tip! Modify your workouts. Add jacks to a plank (move your feet in and out), put your legs straight up in the air for crunches or do a squat/kick combo. Each of these makes the exercise a little harder and gives you a variation that keeps your body guessing.